I've never baked with grapes before. To me, they always seem like the kind of fruit you snack on and didn't have much place in desserts and baked goods. I mean, think about it — how often do you see a grape cake? Grape muffins or grape loaves? Almost never, right? And I'm not exactly sure why. With their sweet, slightly astringent flavor and their consistency matching that of a blueberry (which often makes appearances in muffins and loaves), grapes seem like they'd be the perfect candidate for fruit to use when baking. Really, "cornbread" is a bit of a misnomer — this is more like a corncake. 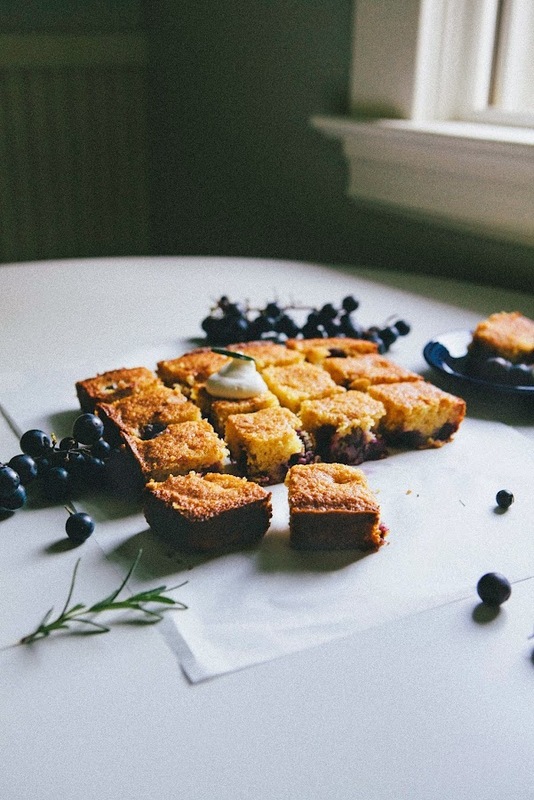 Think: a buttery, honey cornbread with a slight crunchy crisp from the cornmeal, but this time with bursts of fruit flavor from the Concord grapes. I was pleasantly surprised to find that, unlike other fruits that grow more tart during the baking process, these grapes grew sweeter and came to have an almost jam-like taste and texture. I recommend the cornbread for brunch, served warm with a dollop of rosemary-infused whipped cream. Although any kind of grape could theoretically work for this recipe, I went with Concord grapes because they are smaller and don't have much of a seed. If you're using any other kind of grape, be sure to use ones that are smaller (aim for grapes that are slightly bigger than blueberries) and seedless. If you insist on using grapes with seeds, use a cherry pitter to de-seed them and make your life easier! 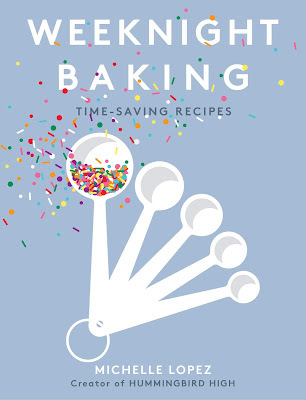 Be sure not to skip the part where you toss the grapes in a tablespoon or two of flour before adding them to the batter. I've talked about this in my recipe for blueberry brownies, but the flour coat absorbs some of the liquid released by the fruit as it bakes and keeps the fruit in place until the crumb has set. A good rule of thumb is to use more flour for riper, juicier fruits and less for less juicy fruits. Be careful not to abuse this rule too much, or you'll end up with dense baked goods whose proportions are all off due to extra flour. Before you make the cornbread, prep the rosemary whipped cream by combining 1/2 cup heavy cream and 2 sprigs fresh rosemary in a small glass jar. Give the jar a good shake or two, before covering and refrigerating until ready to use. This will infuse the whipped cream with rosemary flavor, and will work better in a small container where the rosemary sprigs are completely submerged by the cream. 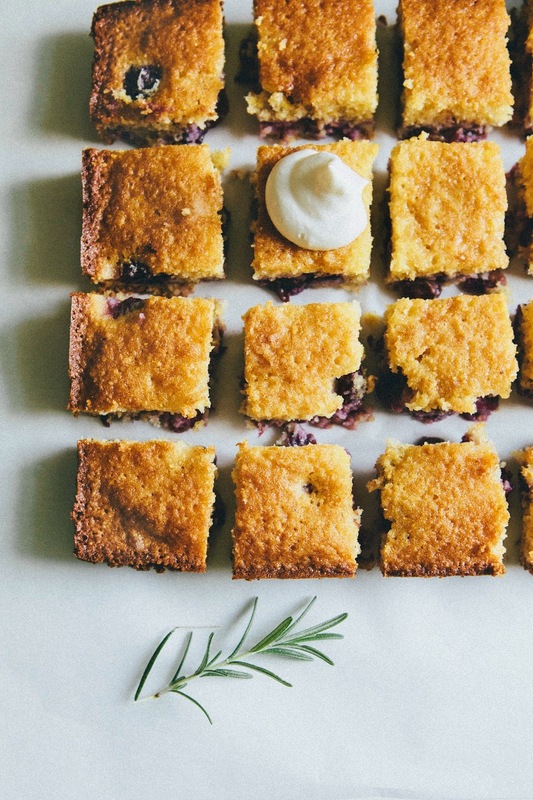 Once you've made the cornbread and you're ready to serve it with the whipped cream, use a fine-mesh strainer to strain out the rosemary sprigs from the cream and into the bowl of a freestanding electric mixer fitted with a paddle attachment. Discard the sprigs. Whip the cream on medium-high speed until soft peaks start to form; add 1 teaspoon granulated sugar and continue whipping until just incorporated. Be careful not to overwhip, or you'll end up with butter! Preheat the oven to 350 (F) and prepare an 8 x 8-inch square baking pan by spraying generously with cooking spray and lining the bottom and sides of the pan with parchment paper, leaving an overhang on two sides of the pan. Spray the parchment paper with cooking spray, and set aside. In a medium bowl, whisk together 1/2 cup plus 2 tablespoons flour, 1/2 cup cornmeal, 1 teaspoon baking powder and 1/2 teaspoon kosher salt. Set aside. In a large bowl, whisk together 2 large eggs, 1/2 cup granulated sugar, 1 teaspoon lemon zest and 1/2 teaspoon pure vanilla extract until fully incorporated. Add 1/4 cup vegetable oil and 2 tablespoons melted unsalted butter, whisking until fully incorporated. Sprinkle the dry ingredients (from the 2nd step) over the surface of the wet ingredients (from the 3rd step), whisking until just combined. It's okay to have one or two flour streaks left at this point, because the next thing you're going to do is add 6 tablespoons buttermilk. Whisk until just incorporated, before drizzling in 2 tablespoons honey. Give a couple more whisks until the honey is evenly spread throughout the mixture, BUT be careful not to fully incorporate. You want streaks of honey visible throughout the batter. Transfer the batter into the prepared baking dish. Toss half of the Concord grapes with the remaining 1 tablespoon of flour until the grapes are well coated. Scatter over cake batter. Transfer to the preheated oven and bake until the cake top sets and is light golden brown around the edges, about 20 minutes. 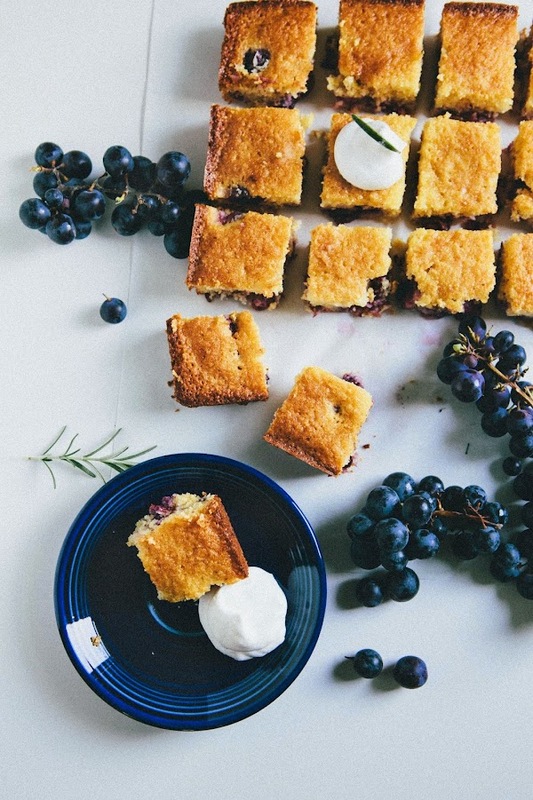 Remove from oven and scatter the remaining half of Concord grapes over the cake top. 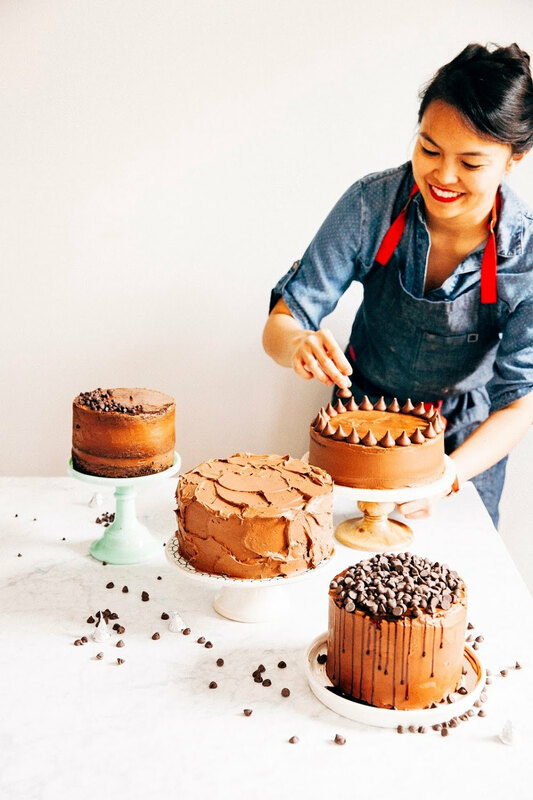 Continue to bake until the top is golden brown and the top of the cake springs back when gently pressed with your finger, around 25 to 30 minutes longer. Transfer to a wire rack and allow to cool slightly in pan. Serve warm or at room temperature. When ready to serve, use the parchment overhangs to lift the cornbread out of the pan. Ok, these might be my favorite photos you have done. I love the contrasting colors. And can I just make a bowl of rosemary whipped cream and eat it by the spoonful? Because that sounds amazing! This looks beautiful, and I want to try it! One question though - I thought concord grapes had lots of big seeds? They are my favorite grapes, but I have always known them to have very big seeds. Is there a seedless variety? The Concord grapes I've always bought tend to be smaller and have a smallish seed, but I do my grocery shopping at some weird hyperlocal hyperorganic market — I wouldn't be surprised if they were some super heirloom kind? Beats me. 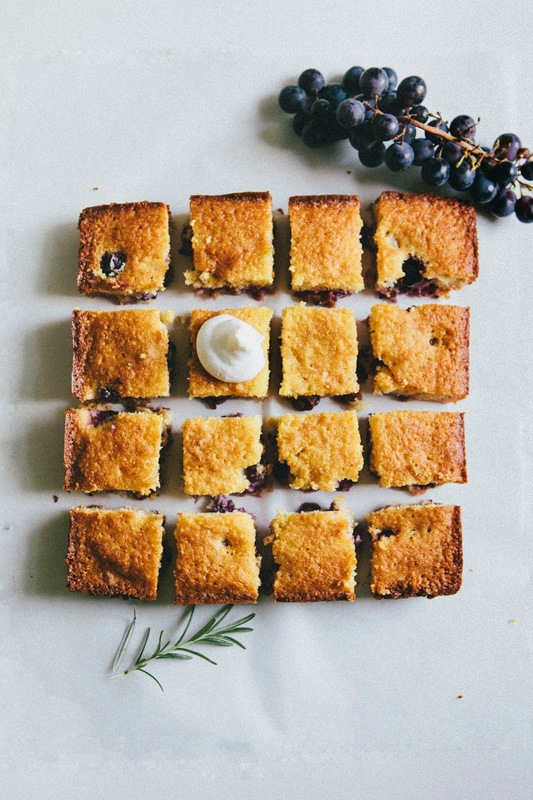 Eitherway, if you're looking to make this cornbread with the grapes you're familiar with, just use a cherry pitter to de-seed the grapes! The pictures look stunning and the recipe gorgeous. that is so amazing! I also love grapes, and also have never used it in pastry. 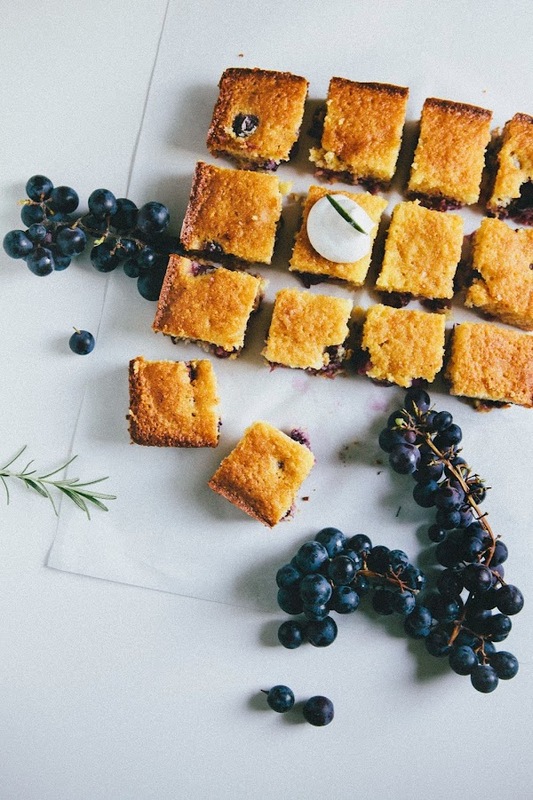 Your post is an inspiration for a grape-baking season! 1) I've never made cornbread 2) I've never baked with grapes. Two things that definitely must be changed. This looks lovely, Michelle! I LOVE this!!!!! I love all your flavor-infused whipped creams (that perfect little dollop with the single rosemary needle! I can't even) and grape cornbread? Stop. Just too, too perfect. I've never baked with grapes either but your description is heavenly -- and um, practically-corncake is the ONLY way I like my cornbread!! I was reading the other day about how true Southern cornbread doesn't have sugar, and I got so sad. hahaha. Sweet, moist cornbread is the ooonly way to go. Especially with these sweet, jammy grapes <3 perfection! This looks absolutely amazing! Roasting the grapes sounds amazing! I've always been intrigued by cornbread but never made it myself - clearly, this has to change stat! This looks amazing! I have never made cornbread, but you are making me want to make some soon!